PLS Blog: What do you win by playing sports? 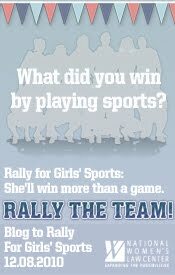 You know we've been running a girls & sports survey with KidsHealth.org. Well, that turned out to be pretty good timing because today is Rally for Girls' Sports Day. It wasn't so long ago (the 1970s) when girls didn't play sports nearly as much as they do today. But there are still girls who might not have found their sport. Keep on looking and trying new things! Don't worry about being perfect at it. Finding a sport you like is like finding a friend. And often you can keep that friend for a lifetime. If you're reading the Pink Locker Society books, you know my fave sport is RUNNING. I was very shy and unconfident in myself until I tried Tae Kwon Do. After I joined I made friends quickly and got more used to presenting stuff (form, kicks, ect.) in front of people. Now I am more outgoing and I am more used to trying new things! That is what I think I won by doing Tae Kwon Do. i won a 3 medals and 18 ribbons 4 swimming. and I keep on earning belts 4 karate. I not that good at sports so I just get the skill like teamwork,reputaton, and excerise by acting and dancing. I think it good to be in after school sport or program were your with a team. I lot theatre budies play sports too so if want try something different it a great thing to try. I know that can do something to do i have well more confindent and instead of being bursting out into song in class I save for rhearsel. All though me and my friends are sort theartical where every we go. I like soccer, swimming, skiing, but most of all... I LUV FIGURE SK8TING!!!!!!! And, well, you win confidence and a healthy amount of pride when you succeed! BTW Today is my b-day, I'm 13 now, whoo-hoo!!! I LOVE sports and they keep me active so it is a really good hobby for me. I love volleyball,football,track,basketball,swimming and a lot more! Sports is an amazing thing that I LOVE! with sports you can have fun1 hang with your friends! do what you love! be active!stay healthy! And have a ton of fun! I started competitive cheerleading at the start of this year im really enjoying it and what i think ive won from cheerleading is a huge amount of self confidence and a bunch of awesome new friends! I love volleyball and i have gotten stronger arms and muscles from it! @josie i fell in love with skating too! !